1. A little respect. What do you get a significant other to mark your 88th anniversary? Matching Under Armour, apparently. NavySports.com has more angles of the gear, and footballs being used in the game will get their own, similar makeover. Why the love? This 2011 piece from Notre Dame’s Blue and Gold Illustrated, written to mark an extension to the rivalry through 2026, puts it better than most. 2. On the defensive. NCAA record-chaser Keenan Reynolds gets most of Navy’s headlines, but the defense has held up its end in the Mids’ 4-0 start, allowing only one opponent to rack up more than 20 points. Against the Irish (4-1), that unit will be without safety Kwazel Bertrand, who broke his ankle late in last week’s win over Air Force, per The Washington Post. Bertrand’s 19 tackles are tied for fifth best on the team, and the senior is the only Mid with more than one fumble recovery this season, scooping up two loose balls in Saturday’s win. Notre Dame’s offensive showing in last weekend’s 24-22 loss to Clemson was its worst all year; the Irish hung 62 points on Massachusetts on Sept. 26. 3. Duke drives north. Army West Point will play host to the Duke Blue Devils in front of a sellout crowd Saturday (noon, CBS Sports Network), and the visitors are making some noise in the Atlantic Coast Conference … even though it isn’t basketball season. Duke (4-1) leads the ACC Coastal Division and ranks ninth in the nation in total defense, allowing less than 270 yards per game. The Blue Devils also bring some experience stopping the option offense, having shut down Georgia Tech in a 34-20 win Sept. 26. If Army fans needed more bad news, there’s the matter of the uncertainty at quarterback: West Point sophomore Ahmad Bradshaw will be ready to play after missing time with an ankle injury, per Army football guru Sal Interdonato, but may not start. 4. Night moves. Air Force will get some national TV time this weekend when it hosts Wyoming (10:15 Eastern, ESPN2), but some fans eager for afternoon kickoffs might trade the extra exposure for a more traditional tailgating time slot. How many more fans? Enough for Air Force athletic director Jim Knowlton to pen a letter explaining how television deals, not the AD, dictate when games will kick off in Colorado Springs. The Falcons (2-2) are heavy favorites to down the Cowboys (0-5) in Air Force’s return to Mountain West Conference play after last week’s loss to Navy. It’s likely that the most must-watch moment in the MWC rivals’ history took place after one of their games ended (Warning: Link contains strong language and references to classic children’s television characters). 5. Scheduling update. After Action mentioned last week that the Big Ten will allow its schools to meet a requirement to play a nonconference “Power Five” foe by scheduling Army. This puts the Black Knights on the same level as SEC, ACC, Big 12 and Pac-12 schools in this particular setup, meaning schedulers seeking a weaker nonconference foe could look toward West Point. Now it appears the other service academies also will fulfill this requirement. Our friends at FBSchedules.com have the details, as well as a breakdown of the Power Five exceptions held by other conferences. What does it mean? 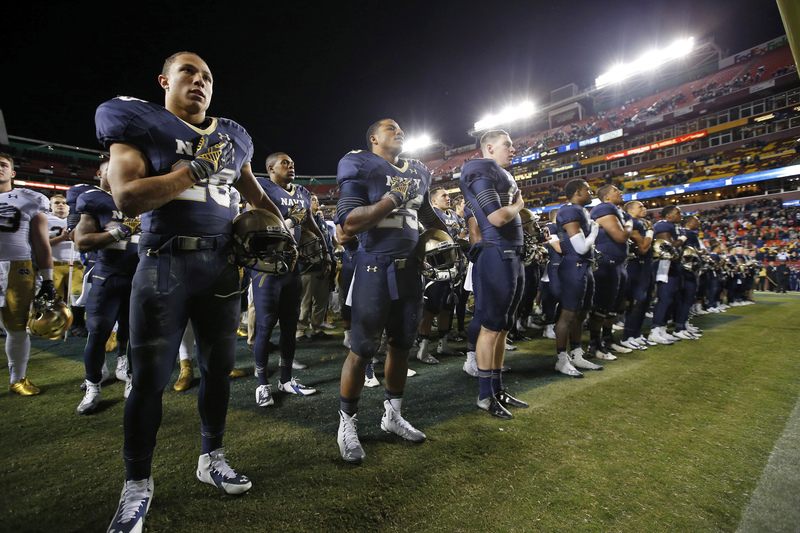 Well, trips like Air Force’s to Michigan State and Army’s to Penn State this season might become more regular, but Navy’s nonconference schedule is fairly limited, with slots booked by Notre Dame, Air Force and Army every season. 6. Odds and ends. An NBC Sports preview of Navy-Notre Dame. …. Your weekly goat-mascot update, courtesy of CapitalGazette.com. …. Find your favorite coach (and his approximate tax bracket) in this year’s USA Today salary survey.